Quinoa rules. It’s gluten-free, pairs well with everything, cooks in 15 minutes, and is high in protein and other good stuff like calcium, phosphorus, magnesium and iron. We like to make this salad Sunday night and have it throughout the week as a side dish, but it would be great on its own as well. If you buy prepackaged quinoa, it should say if it’s been rinsed or not. 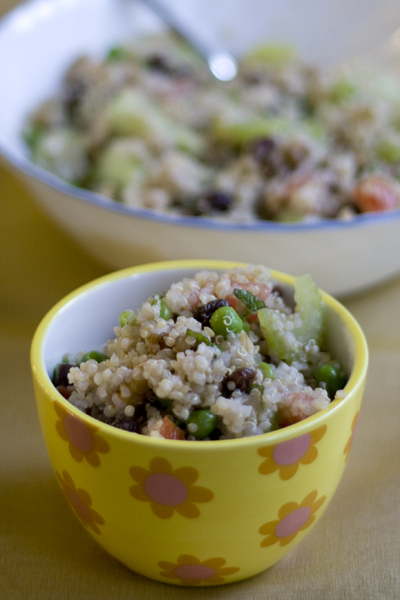 If not, then let the quinoa soak for about 15 minutes or longer to remove the bitter coating that contains saponins. Then give it a quick rinse and it’s ready to be cooked! 1. 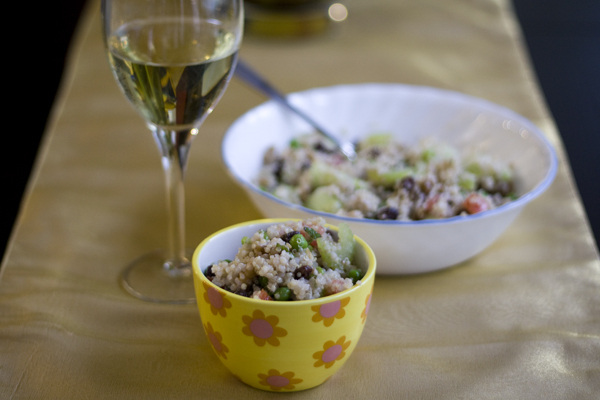 Soak quinoa in cold water for 15 minutes and then rinse under running water using a strainer or a cheese cloth. 2. In a small saucepan over medium heat, bring quinoa, 1/2 teaspoon salt and water to a boil. Reduce heat and allow to simmer for 10 to 15 minutes or until done. Remove from heat, fluff with a fork, cover, and let cool. 3. Chop the English cucumber, mint leaves and tomato and set aside. 4. Boil chopped celery and frozen peas for 4 to 5 minutes, rinse and drain, and then add to chopped vegetables. 5. Whisk together lemon juice, oil, remaining salt, sugar, water and pepper, and refrigerate until ready to serve. 6. Combine all ingredients before serving and toss gently.